« Did I Say Yesterday Was a Downtrending Day? I admit it’s a little embarrassing that it has taken so long, but it looks like the new StreetSmart Pro platform will finally include bracket orders. These new order types and other enhancements were announced long ago and it finally looks like they’ll see the light of day. This will allow me to enter my stop loss along with my original order. Not only will this save me a step but it provides some protection in the unlikely (but probably inevitable, really) event that my original order executes and then disaster strikes (power outage, Internet outage, etc) before I can enter my stop loss order. I’m eager to test out the new platform which I’m hoping will even have more flexibility than this shows. 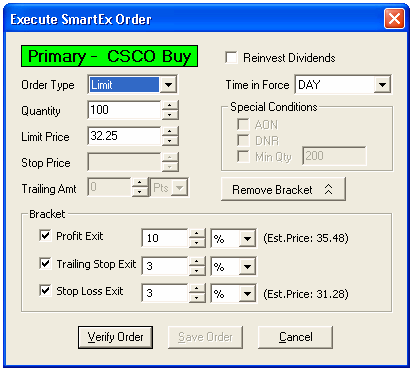 I’d like to go ahead and enter a partial profit order as well at the same time. Judging from the screenshot, it looks like you can enter a profit exit, but it looks like it’s probably going to exit 100% of the position which I don’t want. Perhaps this is a moot point, however. Some of the research I’m doing with my trading system using StockTickr suggests that partials just get in the way and maybe even hurt profitability over a large number of trades. But I digress.